157 - "Really, Miss Henderson!" 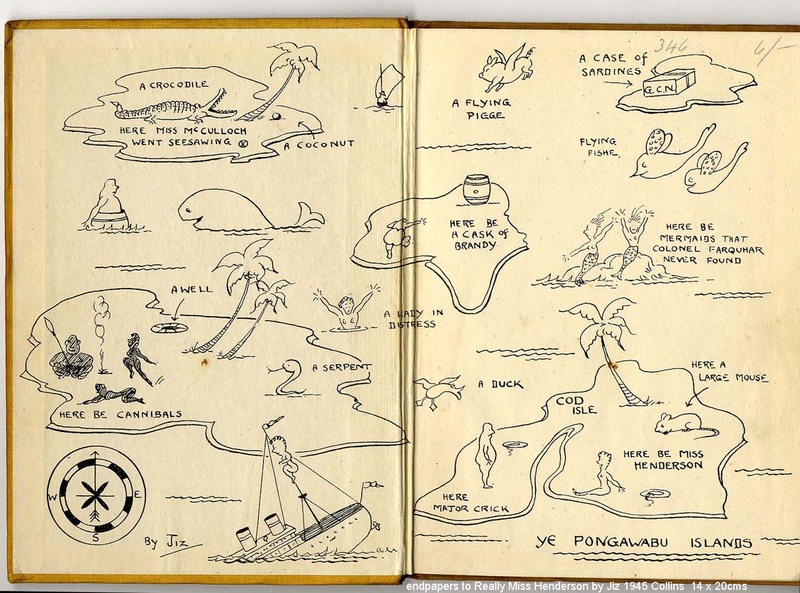 a group of British eccentrics (women and men, most of whom in the military) was shipwrecked in a small, isolated archipelago in the South Seas called the Pongawabu Islands. Major Crick and Miss Henderson are stuck on Cod Island, together with a rather large mouse. Imagine the hilarious and semi-romantic storylines one could come up with, using only these ingredients. An unnamed island holds a cask of brandy and may thus be partially responsible for the sightings of mermaids by Colonel Farquhar, not to mention the flying pig. On an outlying island, there is a case of sardines. The shipwreck survivors have to get over their differences and band together to obtain the food that will sustain them during their ordeal. The lady in distress is very mysterious because of her immodest dress sense. She might be a native maiden, but then a very pale one. Surely,she can´t be English! Maybe she´s French?This map was found here at fulltable.com, a site that collects some interesting examples of end paper maps in books.